Many people like to go out for a fancy meal for their birthday with a big group of people and celebrate all night. That sounds like a lot of fun, but when the first lady asked me what I wanted to do for my birthday, I think she already knew the answer - I wanted to go out for pizza! Obviously we would have to go somewhere that we haven't been to yet and review the pizza. To pick just the right place, I consulted my list of reader suggestions for a place which wouldn't require a very lengthy road trip for us. 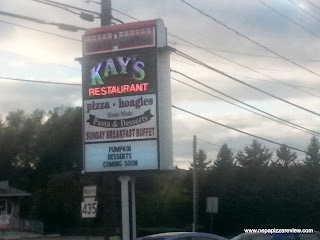 One place really stuck out to me, with many people suggesting that I try out Kay's in Daleville/Moscow. We decided we would trek to Kay's and finally try this highly touted pizza. The place was really easy to find on the main route in Daleville directly across from a large shopping center. When we pulled into the parking lot, it was apparent that Kay's has been in business for a really long time. You could tell that the building is quite a landmark, and as we walked inside we could see that the history was pretty well preserved with the many old signs and artifacts covering the walls. 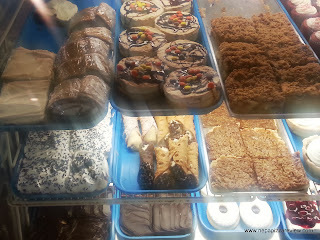 The desert case caught our eye as soon as we walked in the door. There were so many delicious looking deserts including cannoli, gigantic eclairs, cakes, brownies, and much more. I wished I could have one of everything, but we went for the pizza, so we reluctantly left the pastry case and followed our hostess to our table in the very family friendly and down-home comfortable dining room. The tables are packed pretty close together, but everyone seemed so happy and friendly that it created a pleasant atmosphere to dine in. We ordered a regular 16" pizza for $10.95 based on reader recommendations, although there were many different types of pizza to choose from including the crunchy crust, deep dish, old forge, and gluten free. 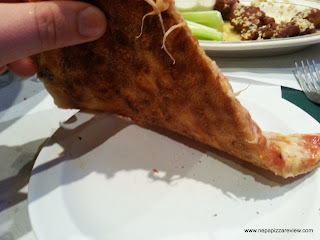 I think I tried the crunchy crust a week earlier at La Festa Italiana, so I had a pretty good idea of what that was all about and didn't want to try the same thing. As we waited for our pizza to be delivered to our table, we were treated to a pepperoncini and chick pea salad and watched many delicious-looking Italian entrees being sat down in front of hungry and smiling diners. Every entrée we observed provided a very generous portion size, and smelled terrific. After about 10 minutes, our pizza was ready and I was able to stop staring at other people's dinners and mind my own business! I have to say, with this pizza being highly recommended with so much fanfare, my hopes were very high for this pie. When it was delivered to our table, it looked OK in appearance, and cooked a little on the light side. We weren't overwhelmed by appearance, so we hoped that there was more to this pizza than meets the eye. I picked up my first slice with some difficulty as the crust was undercooked, soggy, and droopy and plopped it on my plate. I took my first bite, hoping for a flavor explosion, but got nothing more than the flavor of your standard New York Style pizza. As I said, the dough was undercooked and really sapped the flavor out of the pie. The sauce was heavily seasoned with oregano and didn't have a great balance. 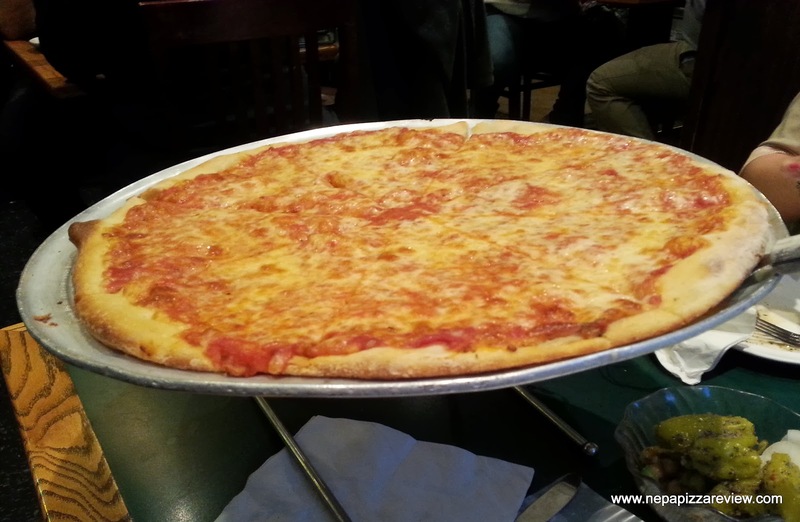 I did like the blend of cheeses, which I would guess would be mozzarella and cheddar. Overall, I would venture to guess that this wasn't Kay's best effort as we visited on a busy night, but I don't think this pizza would have wowed me on it's best day. I'd say it's a decent pizza and it serves its purpose, but I wouldn't order it again. Instead I would opt for one of Kay's mouth-watering dinners and follow it up with an amazing desert. At the very least, I would try one of the many other types of pizza they have to other. 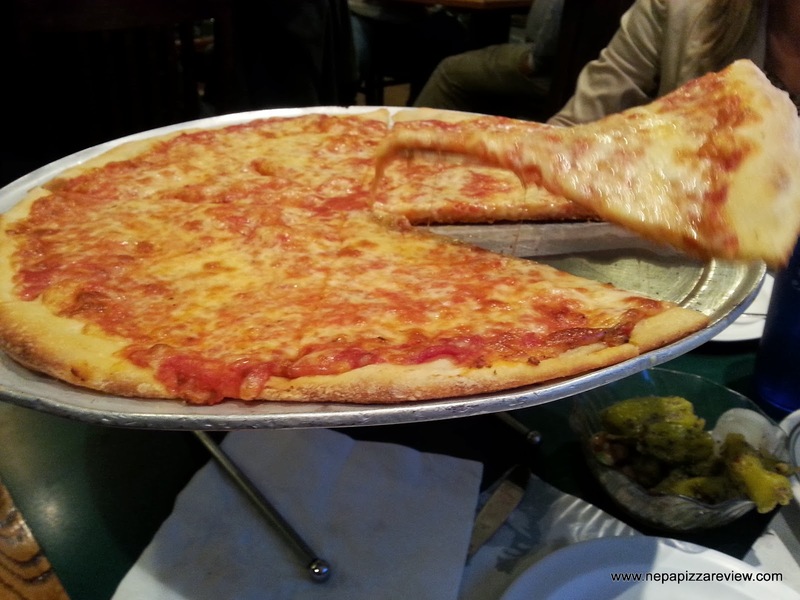 So, in my opinion, I didn't find this pizza worth the road trip, but I would certainly return to Kay's for the courteous service, generous portions of Italian cuisine, friendly atmosphere, and historical value. I do recommend the restaurant, but I can't give you my stamp of approval on the regular pizza. Help me out here, was this just an off night? Please share your thoughts on this place in the comments below! Judging by the pics, your review seems (as usual) spot-on. This looks like your standard Sysco-sourced pie. It's better than no pizza at all, but not really better than DiGiorno. Pizza makers need to be called out on using cheap, mass-sourced ingredients. Keep up the good work!